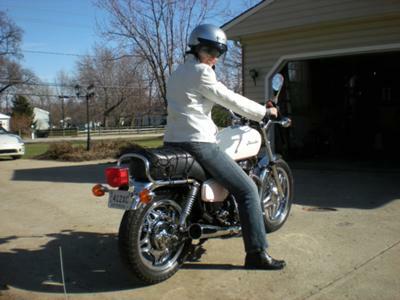 I bought my '83 Honda 450 last summer - it was in excellent condition, but I didn't care for the black & dark gray coloring. I had the tank & side cover painted "MaryKay" pink & pearl white with silver pinstripe. I also had the wheels & various other parts chromed out. This bike is so fun to ride and it gets a lot of attention. I love riding with my hubby, or on my own - cruising through the neighborhood. ... BEAUTIFUL! I have an old Honda too ('77 GL1000) and I love it! The older bikes always get a lot of attention and the Hondas give good service. Perfect combination. Enjoy! Hi Sharon....just wanted to say what a nice bike U have there. The color scheme sounds awesome & from the pic I see, the bike is really cool. Looks like a new bike...way to roll my friend!